Purple Panthers snap 3-game losing streak with impressive performance. WATERVILLE — Lights, cameras, action. The portable lights were on for their annual homecoming appearance at Drummond Field on Friday night, and the Waterville football team delivered on the bright stage. Racking up more than 400 yards of total offense, nearly all of it on the ground, the Purple Panthers pulled away in the second half for a 34-6 win over Medomak Valley in a crucial Big 11 Conference matchup for both teams in the only Friday night home game for Waterville this season. With the win, Waterville snapped a three-game losing streak to improve to 2-3 on the season. Thompson and classmate Nick Wildhaber were instrumental in the victory. 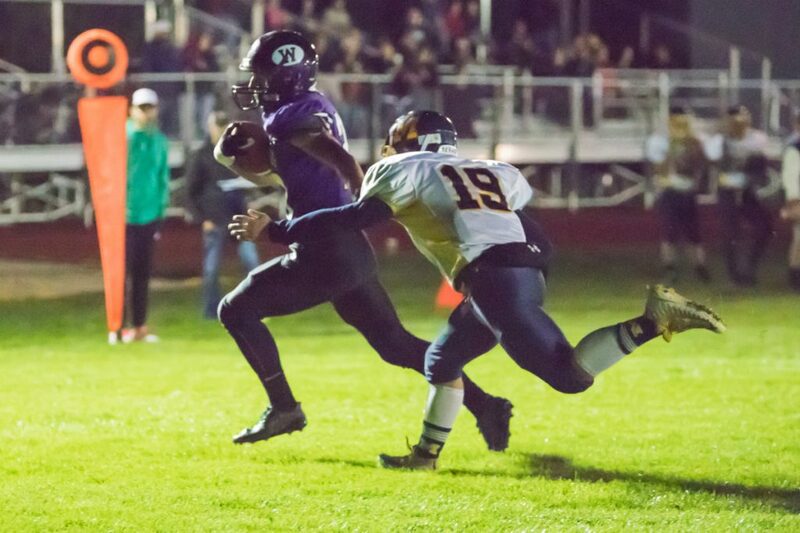 While Thompson ran for 129 yards and accounted for a pair of scores, Wildhaber was nearly unstoppable with 130 yards of his own on the ground and three touchdowns. 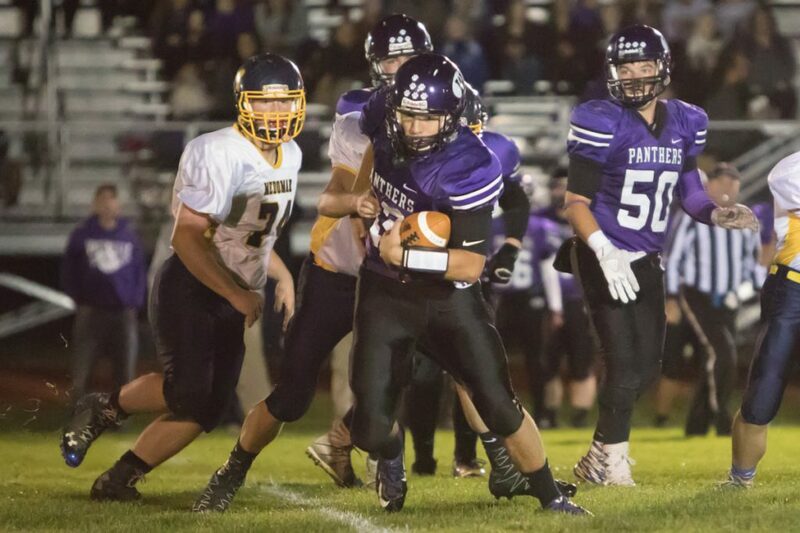 In all, the Purple Panthers rushed for 380 yards on the ground — more than three times Medomak’s total offensive output for the night, either across land or air. Junior back Anthony Singh contributed another 71 yards rushing as a third option out of the backfield. Medomak (2-3) hung around in the first half and trailed just 13-7 at the break. Quarterback Eli Miller tossed a 16-yard touchdown pass to Brian Pollard with 8:23 remaining in the second quarter to tie the game at 6-6, and junior defensive back Gabe Shellman picked off a Thompson pass in front of the end zone in the final second of the first half to keep the game close. But a tight contest turned in the third quarter — not quickly, but methodically, as Waterville’s punishing run game took over. The Purple Panthers took the third quarter kick and marched 63 yards on 16 plays, chewing up more than eight and a half minutes on the clock and taking a 19-6 lead on Wildhaber’s 8-yard touchdown run. Medomak, which gained minus-20 yards as a team in the second half, lost 12 yards across its first three plays of the half and then dropped 6 more when a botched snap on a punt attempt set Waterville up first-and-10 from the Medomak 15. The visitors managed just 97 yards of inconsistent offense on the night. Three plays later, Wildhaber — who opened the night with a 4-yard touchdown run in the first quarter — was in again, this time from 5 yards out for a 27-6 advantage. Waterville put the punctuation mark on the win with another long drive, this time in the final quarter. Covering 65 yards on 10 plays and nearly six and a half minutes, Thompson capped his big night under center with an 8-yard touchdown run. Thompson had given Waterville the lead for good late in the second quarter with a 4-yard scoring pass to Kody Vallee in the rear left corner of the end zone. The only thing to slow Waterville’s offense was a 29-minute delay following Vallee’s touchdown, as medical personnel tended to an event staff member who was injured when players tumbled out of bounds next to the end zone on the play.